Walmart has been aggressive with its online business lately, committing to invest $900 million in web development over the next two years. It’s also partnered with Uber and Lyft to expand its online delivery service, while shortening its free-shipping window to two days, matching Amazon Prime’s offering. But it appears these efforts have not materialised into much online growth for Walmart yet, with people spending even less on Walmart’s online store on average over the past 6 months — while Amazon saw the average spend grow significantly. 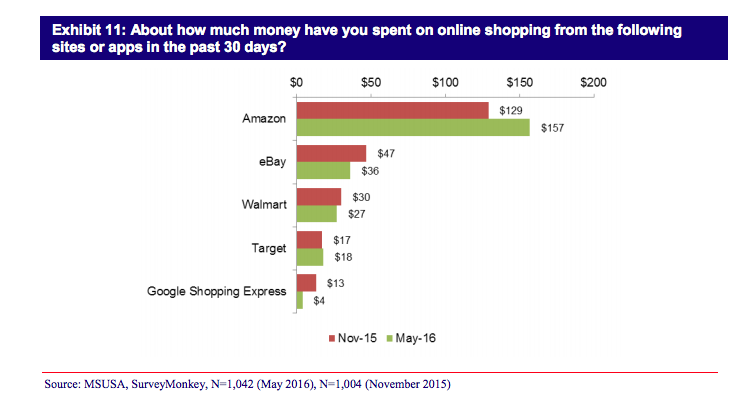 According to a new survey by the financial research firm Mizuho, Amazon users spend about $157 a month on average, up from $130 a month in November 2015. Meanwhile, Walmart’s average spend dropped from $30 a month to $27 a month, according to the survey. Mizuho noted that a big part of Amazon’s growth has to do with mobile, as 67% of the survey respondents picked Amazon as their top mobile shopping sites, up from 61% in November 2015. That’s far higher than eBay, which came in at 2nd with a 29% share, or Walmart’s 23%. That doesn’t mean it’s all doom and gloom for Walmart, which is still the largest brick-and-mortar retailer in the US. Plus, online shopping accounts for less than 10% of total retail sales, meaning most people still prefer shopping in-store. But at least in online shopping, Amazon continues to be the king, as the latest sales figures show: Walmart’s online sales were $13.7 billion in fiscal 2015 versus Amazon’s $99.1 billion in online and electronic device sales.